The meeting started 30 minutes late for lack of a quorum, after it was clarified that commissioners had to be physically present in order to vote. Malverne Winborne participated in the meeting via conference call, but did not vote. The FY 2014 public art plan was approved by AAPAC at its March 27, 2013 meeting. The request to shift the date of the annual plan is linked to a broader overhaul of the city’s public art program. A city council committee has been developing a proposal for dramatic revisions to the public art ordinance. Recommendations are expected to be on the council’s May 6 agenda. In order for these enhancements to occur, recommendations from AAPAC need to be more closely tied to the process of developing the city’s capital improvements plan (CIP). That process begins in September and wraps up in December, when the CIP is approved by the city planning commission. The city council then incorporates the CIP into its budgeting process early in the following year. At AAPAC’s April 24 meeting, Craig Hupy – the city’s public services area administrator – described how the new approach would work. He told commissioners that the first couple of years would likely be “rough,” as the city staff gets comfortable with incorporating public art and other enhancements into the capital projects. From left: Ann Arbor public art commissioners Connie Brown and Ashlee Arder. Outcome: Commissioners approved the change in their annual calendar. Changes to Public Art Program: What’s Next? Later in the meeting, Nick Zagar returned to the issue of the proposed changes to the city’s public art program. Would there be any opportunities to do “ephemeral” projects, under this new approach? [Currently, public art projects funded by the Percent for Art program must be permanent.] If someone has a great idea, he asked, how can AAPAC help make that happen? Aaron Seagraves, the city’s public art administrator, told commissioners that things are still in limbo, until the city council makes changes to the program. Bob Miller added that if a project can be done without using public funding, then commissioners should “go for it.” He cited the DIA’s Inside|Out program as an example, as well as an art-on-loan program he hopes to develop. Hupy added that if AAPAC can partner with other organizations and look for private funding, that’s one possible way to support projects. John Kotarski argued that AAPAC’s role is to be visionary and to act as an advisor, “as opposed to a cashier.” The council wants more art, not less, he said, but there has to be broader buy-in to the projects than has happened in the past. Miller felt that the big art projects of recent years – like the Dreiseitl water sculpture in front of city hall or Ed Carpenter’s hanging sculpture in the Justice Center lobby – might be less likely in the future. Instead, there might be more smaller, “pedestrian” projects – things like designed manhole covers, benches or bike racks. Seagraves urged commissioners to think big still, saying that AAPAC could spearhead projects and even take the lead on private fundraising. The ordinance changes being considered by the city council aim to create an atmosphere that encourages fundraising, he said. 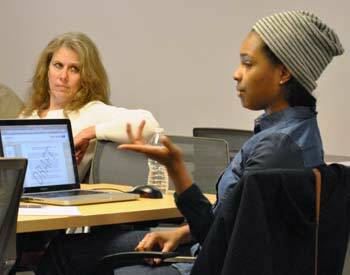 Ashlee Arder observed that it seems AAPAC needs to rebrand itself to the community. It’s becoming a more participatory entity, she said, but people in the community don’t yet know that AAPAC can be approached for projects. Commissioners need to explore fresh ways of communicating, Arder added. She urged them to think about other rebranding campaigns they’ve observed – a product, institution or celebrity – and how something similar might work for AAPAC. At their March 27, 2013 meeting, commissioners had voted 5-1 vote in favor of asking that the city council consider adding students to AAPAC by modifying the ordinance that governs the commission’s composition. Marsha Chamberlin had dissented, saying she supported the concept of student involvement but didn’t like this approach. She’d rather handle it informally, perhaps by including students in the task forces that are set up for each project. The proposal had been brought forward by John Kotarski, who advocated for adding three students to the nine-member commission as voting members. He suggested that the student commissioners be selected by: (1) the Ann Arbor Public Schools board of education; (2) the dean of the University of Michigan School of Art & Design; and (3) the Arts at Michigan program. Deb Mexicotte, president of the AAPS board, is also program coordinator for Arts at Michigan. Discussion among commissioners covered much of the same ground as their deliberations on March 27. The draft memo indicated that up to two students would be added, rather than the three members that were originally proposed. After some back-and-forth, commissioners reached a consensus that two student members would be sufficient. They were also acting on the advice of Craig Hupy, the city’s public services area administrator, who noted that an odd-numbered membership was preferred. Adding two students would bring the commission up to 11 members. For the UM position, Ashlee Arder suggested involving the student advisory group of the University of Michigan Museum of Art (UMMA), which draws students from different disciplines. She had served on the group when she attended UM. Commissioners also decided that the student terms should reflect the academic year, and ideally students would make a two-year commitment. [Current commissioners serve three-year terms.] Nick Zagar expressed some hesitation over a two-year term, and wondered how the commission would handle a student who didn’t fully participate. Zagar also noted that serving on the commission would be a significant commitment for a high school student, and would essentially prevent the student from participating in sports or many other extra-curricular after-school activities. Kotarski agreed, but said he hoped the school would recognize it as a learning experience for students. Outcome: Commissioners approved the draft memo recommending the addition of two students as voting members of AAPAC. The memo will be sent to the city council for consideration. Several projects were discussed briefly during the March 27 meeting, by way of updates. Additional information was also included in a written report by Aaron Seagraves, the city’s public art administrator. These projects were already in progress when the city council temporarily halted spending on public art late last year, or are not using Percent for Art funds. 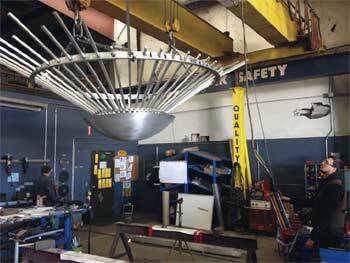 Seagraves gave a slideshow of images from the workshop where Oregon artist Ed Carpenter‘s hanging glass sculpture, “Radius,” is being made. [.pdf of slideshow presentation] The fabrication is being done in a studio in Portland, Oregon. Seagraves reported that drywall and electrical work is underway in the Justice Center lobby, with final installation to occur over the Memorial Day weekend, starting May 25. The project was approved by the city council in May of 2012 based on AAPAC’s recommendation, with a budget of $150,000. Members of the project’s task force are: Margaret Parker, Elaine Sims, Bob Grese, Laura Rubin, Margie Teall, Ray Detter, Maureen Devine and Karl Daubmann. The Justice Center is located next to city hall, at 301 E. Huron. It houses the 15th District Court and Ann Arbor police department. Connie Brown asked about plans for a dedication of the sculpture. Seagraves replied that Carpenter is interested in returning for a dedication ceremony three or four weeks after installation. The other option would be to hold it on the Tuesday, May 28, following the Memorial Day holiday. John Kotarski said he also wanted to involve University of Michigan students with the installation. Seagraves reported that Carpenter has suggested that students could drop by the Justice Center at 11 a.m. on Tuesday, May 28. By then, however, the installation is expected to be complete. Presentations of proposals from four finalists for artwork at the East Stadium bridge are set for June 7. The finalists are: Volkan Alkanoglu, based in Atlanta, Georgia; Sheila Klein of Bow, Washington; Rebar Group of San Francisco; and Catherine Widgery of Cambridge, Mass. The project has a budget of $400,000. Members of the task force are Wiltrud Simbuerger, Bob Miller, Nancy Leff, David Huntoon and Joss Kiely. The June 7 presentations will be open to the public, and likely occur between 2-6 p.m. Details haven’t yet been finalized. At AAPAC’s March 27, 2013 meeting, commissioners selected Denver artist Josh Wiener to work with landscapers and incorporate public art into a new rain garden at the corner of Kingsley and First. The $27,000 project was one of several for which funding had already been approved, prior to the council’s decision to temporarily halt spending on public art. On April 24, Seagraves reported that Wiener will be coming to Ann Arbor sometime in May. A public meeting is being planned at the site of the future rain garden, so that residents can talk with Wiener as well as with the project’s landscape architect. That piece of the project is being handled by Conservation Design Forum (CDF). Task force members making the recommendations for this project are Connie Brown, Jerry Hancock, Claudette Stern, John Walters and Jeff Kahn. At a special meeting on March 7, 2013, AAPAC had voted to accept a memorial for Coleman Jewett as an official AAPAC project and to approve Sarah Gay as a volunteer project manager. Her duties were to lead efforts for city council approval, donor relations and fundraising. The original proposal was for a bronze Adirondack chair at the Ann Arbor farmers market. Jewett was a long-time local educator who died in January. After he retired, he made furniture that he sold at the Ann Arbor farmers market. A private donor has committed $5,000 to create a memorial at the market, in the form of a bronze replica of one of Jewett’s Adirondack chairs. Marsha Chamberlin, who has been coordinating with Gay, did not attend AAPAC’s April 24 meeting but provided a written report. [.pdf of Chamberlin's report] The report indicated that the project is still in the information-gathering stage. It’s likely that a recommendation now will be for creating two chairs – one for an adult, another for a child – to reflect Coleman’s “sit and chat” style at the market. Chamberlin’s report indicated that she’ll provide a more detailed update at AAPAC’s May 22 meeting. 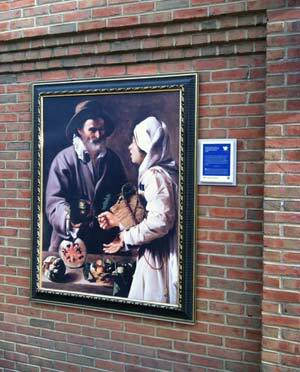 A reproduction of “The Fruit Vendor” by II Pensionate del Saraceni is located near the entrance of Kerrytown Market & Shops. It’s part of the Detroit Institute of Arts Inside|Out program. John Kotarski reported that on the weekend of April 20-21, he and city councilmember Sally Petersen had organized bus trips for low-income families to go to the Detroit Institute of Arts. The DIA was offering free admission to Ann Arbor residents as part of the Inside|Out program. Ann Arbor is one of several cities where the DIA has installed framed reproductions from its collection at outdoor locations on building facades. Kotarski said that two buses took people who live in Ann Arbor public housing or who are staying at the Alpha House shelter. For many people, it was their first time visiting a museum, he said. Also related to Inside|Out, AAPAC is partnering with the Ann Arbor Hands-On Museum to offer free docent walking tours of the installations as well as other public art in the downtown area. The tours take place on Saturdays and Sundays, starting on April 27 through June, leaving from the Ann Arbor Hands-On Museum every half-hour between noon and 3 p.m. The museum is located next to the downtown fire station, at 220 E. Ann. Kotarski said the Ann Arbor Art Center is interested in offering similar tours, starting from its location at 117 W. Liberty. The DIA will be providing free training for volunteer docents. The competition would be to draw images and messages on the street around stormdrains, highlighting connections to the river. It would occur in two stages, starting with a chalk art contest at the June 14 Green Fair on Main Street. Artists would use chalk art to draw images around the stormdrains along Main Street between Huron and William, with winners selected by people who attend the fair as well as by a jury of judges. Local artist David Zinn, known for his chalk art installations, will be helping as a consultant. The second phase of the project would entail working with neighborhoods, as part of HRWC’s stormdrain awareness program, to create chalk drawings around street stormdrains throughout the city, on a volunteer basis. The intent is for artists from phase 1 to help guide the work by neighborhood volunteers. Expenses would be paid for at least in part out of the city’s stormwater fund, which includes money for educational efforts. At AAPAC’s April 24 meeting, Seagraves told commissioners that the deadline for applying to participate was May 1, but that HRWC might extend the deadline, depending on how many entries are received. Nine artists will be selected by Frenzel, Seagraves and Zinn to participate in the Green Fair chalk contest. Responding to an email query from The Chronicle on April 30, Frenzel reported that the deadline has been extended until May 14. The hope is to have at least a dozen submissions. The top two winners – selected by judges and by popular vote at the Green Fair – will each win $150. A selection panel has narrowed down the 50 proposals received for artwork along the Argo Cascades, selecting seven artists for a closer look. Members of the selection panel include John Kotarski, Malverne Winborne, Cheryl Saam, Margaret Parker, Cathy Fleisher, Bonnie Greenspoon and Julie Grand. Marsha Chamberlin, who has been working on a canoe art project with other local organizations, did not attend AAPAC’s April 24 meeting. Seagraves gave a brief report, noting that a name has been selected for this project: Canoe Imagine Art. This project is not an official AAPAC project. Chamberlin is working with the Main Street Area Association, the Ann Arbor Convention & Visitors Bureau and others on an effort using old canoes – boats that the city was getting rid of – for a community art project. Details are still being developed. Bob Miller, AAPAC’s chair, encouraged commissioners to read the draft South State Street corridor draft report and provide feedback related to the public art component. He asked them to email Seagraves by May 17, so that Seagraves could then compile and submit the feedback to the city’s planning staff. Aaron Seagraves reported that a press release would be issued to seek nominations for the annual Golden Paintbrush awards, which recognize local contributions to public art. Nominations will be accepted until May 21, with winners selected by AAPAC and honored at a city council meeting this summer. Last year’s winners were Jim Cogswell, David Zinn and Margaret Parker, a former AAPAC chair. 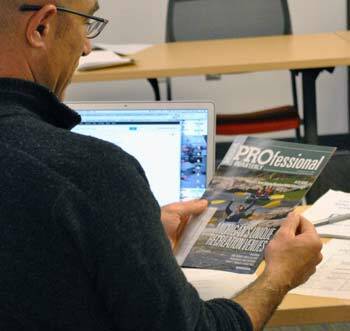 John Kotarski, a member of AAPAC’s public relations committee, noted that last year the committee had considered renaming the awards, but couldn’t settle on a new name. It’s something to consider for next year, he said. Commissioners present: Ashlee Arder, Connie Brown, John Kotarski, Bob Miller, Malverne Winborne (via speakerphone), Nick Zagar. Also: Aaron Seagraves, the city’s public art administrator, and Craig Hupy, the city’s public services area administrator. I wish there was a mechanism in place to call for a vote of ‘no confidence’ in the way our precious tax dollars are being spent on so-called art. Half a million dollars to dress up the ugly stadium bridges and bury a bunch of canoes by the cascades. Is this really where we need to be spending money as a community? My nominees for the golden paintbrush? SAES and Mole. Wow more bummers from the art commission, you are reporting on a sidewalk art contest on May 1st and the deadline for the somewhat lengthy application is…. May 1st. I am on every email list the city offers, and this is the first I have heard of this event, and now it is too late to enter. This gets to the heart of what is wrong with Ann Arbor, apparently only those in the know are able to participate in city affairs. Extended until May 14 th, because no one knew about it. Why should we trust these folks with our tax money?